As an Austin real estate broker and with over a decade of sales and marketing experience, Robin Banister believes in an honest approach based on concise, professional guidance while exercising the utmost in discretion. She treats her clients like family and is focused on offering unrivaled client services. Her intuitive nature allows her to successfully match her client's lifestyle desires and goals with the neighborhood and property. Robin: I’m Robin Banister and I’d like to tell you about exclusive real estate behind the scenes. What my clients really appreciate about me is my enthusiasm for the task. No job is too big or too small. I roll up my sleeves and I get to work. You tell me exactly what you want and I’m going to turn over every stone until I find it for you. There are no problems, only solutions. My career in the real estate business began when I was fresh out of college. I started in my family’s home building business. I was a loan processor. I was in land development. Every aspect I’ve pretty much been involved with. It’s just in my blood. The industry is constantly evolving and changing, and you have to keep up with the changes. Gottesman believes in an out-of-the-box approach, and we strive to do bigger and what’s next and be ahead of the curve. One thing I truly believe in is that nothing will replace good old fashioned face-to-face conversation, and that’s what I do best. Austin is such a dynamic place, and so many exciting things are happening here on a daily basis. I love my job because I get to explore these changes and see what’s happening with my clients, through their eyes. I love going to the lake. I love going to the hike and bike trail. I love trying new restaurants. It’s just a fantastic city. 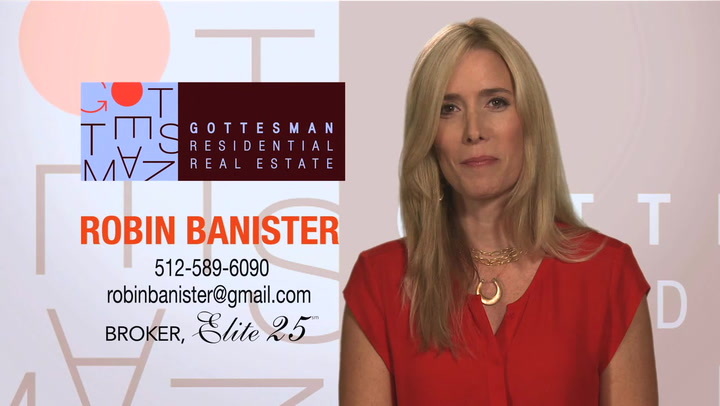 My brand and the Gottesman name bring value to every transaction. When the Gottesman name is associated with a property, people say, “Wow, that must be a fantastic house because it’s a Gottesman listing.” We always strive for perfection, and we deliver. Anybody can help you buy or list a home. What sets me apart is my networking, my contacts and my staff behind the scenes. Robin works through referrals based on accolades from highly satisfied clients and her commitment to superior service. Her dedicated work ethic and seasoned market knowledge have positioned her as a multi-million dollar producer. Robin prides herself in being able to offer her clients access to many exclusive private listings. When working with Robin, you'll have access to the finest and most exclusive properties Austin has to offer.